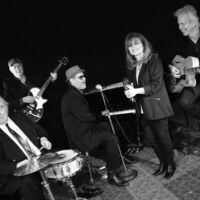 Professor Louie & The Crowmatix began as the studio backing band for Aaron "Professor Louie's" musical productions for the Rock and Roll Hall of Fame Inductees, The Band. Rick Danko christened him Professor Louie due to his work and friendship with The Band. Professor Louie & The Crowmatix repertoire is steeped in Rock 'n' Roll, Blues, Gospel and American Roots music. They have 13 studio CD's on The Woodstock Records label. Their 2017 recording Crowin' The Blues was on The National Contemporary Blues Music Reports Charts in the top 20 for the first quarter. Their CD Music From Hurley Mountain voted best concept record & group by Radio Crystal Blue in 2016. PL&C have been inducted into Blues Hall Of Fame, New York Chapter and hold a permanent place in the Canada South Blues Museum. The Crowmatix are John Platania (guitar), Gary Burke (drums), Miss Marie (vocals, percussion, keyboard), and Frank Campbell (bass).